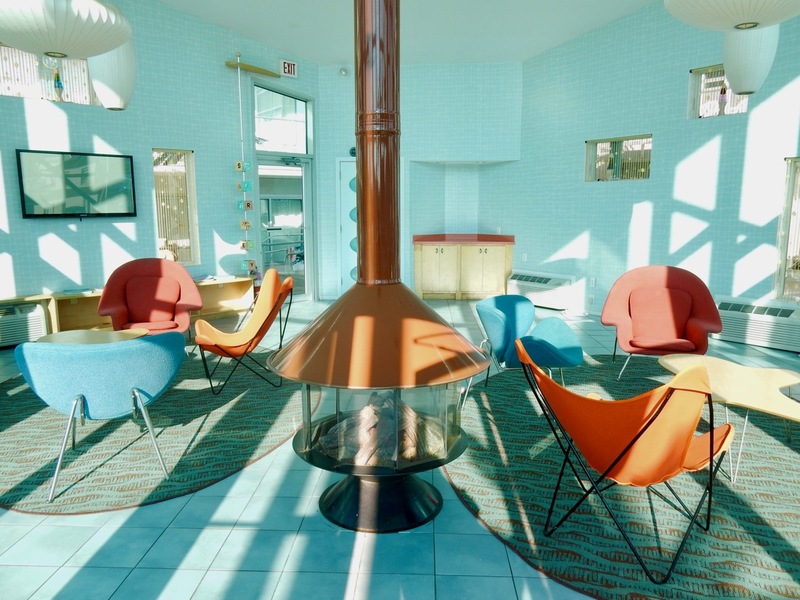 In 2000, the Morey brothers renovated the old Wingate – turning the faded Wildwood icon into The Starlux Hotel a retro-chic starburst of a lodging. Proving that a hotel doesn’t have to be 5-star to be special, The Starlux is not “luxurious” in the private-butler lavish sense, but is a portal back to a simpler time, with witty, sweet, and immaculate rooms, a cool style that harks back to the Mad-Men 60’s, and a warm and welcoming family friendly vibe. On a corner of Rio Grande Ave., one block from the infinitely Instagrammed Wildwood sign at the Boardwalk, the Starlux perfectly encapsulates a Doo Wop weekend of sun, fun, and a ton of 50’s music and architecture. Starry signage, indicative of 50’s Jetson’s décor, glows neon bright at dusk. Rooms open onto outdoor walkways overlooking a curvaceous pool, the glass enclosed lobby harbors a jewel-toned Designs Within Reach collection of mid-Century Modern seating and tables, and the tiny check-in area is configured to accommodate one receptionist, a trove of beach paraphernalia, and a few guests. Employees are helpful, kind, and very laid back. The Morey’s must have purchased all the lava lamps in New Jersey: each room sports one. 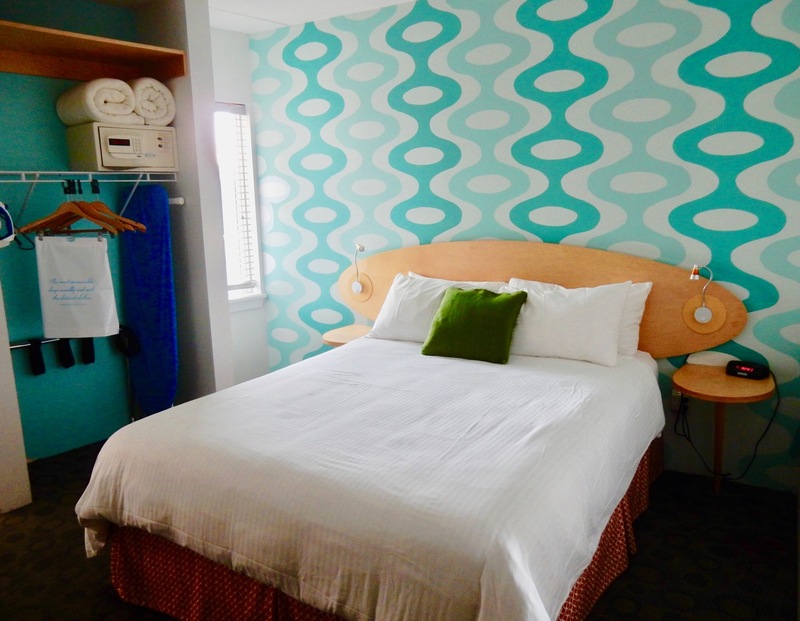 Loopy green and white wallpaper, surfboard bed headboards, squiggly mirrors, Deco-Modern chest of drawers, and open closet space, flat screen TV’s and hair-driers, all add up to 20th Century kitsch modified for the 21st century traveler. Each suite offers a galley kitchen, large enough to feed a family of 4, and sitting area with pullout couch and second TV. Pool, hot tub, wi-fi, parking. Starlux Mini-Golf. Three dog-friendly mini-golf courses – 1. Ocean Theme, 2. Beach Theme, 3. 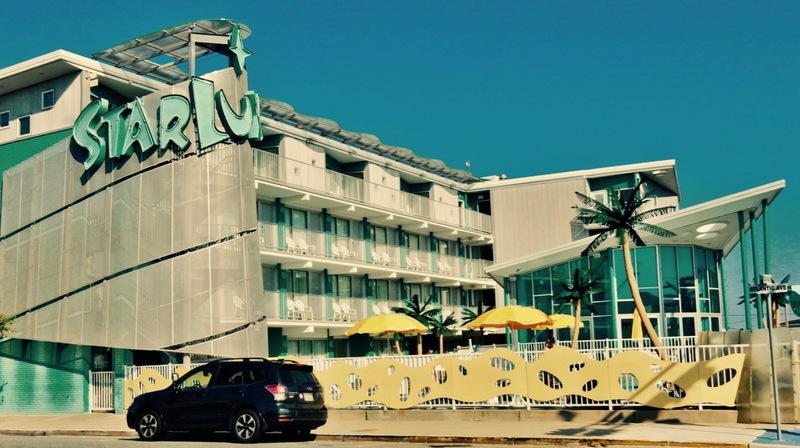 Boardwalk Theme – on two top levels are just past the fire-pit on a sandy patch of land next to the hotel. 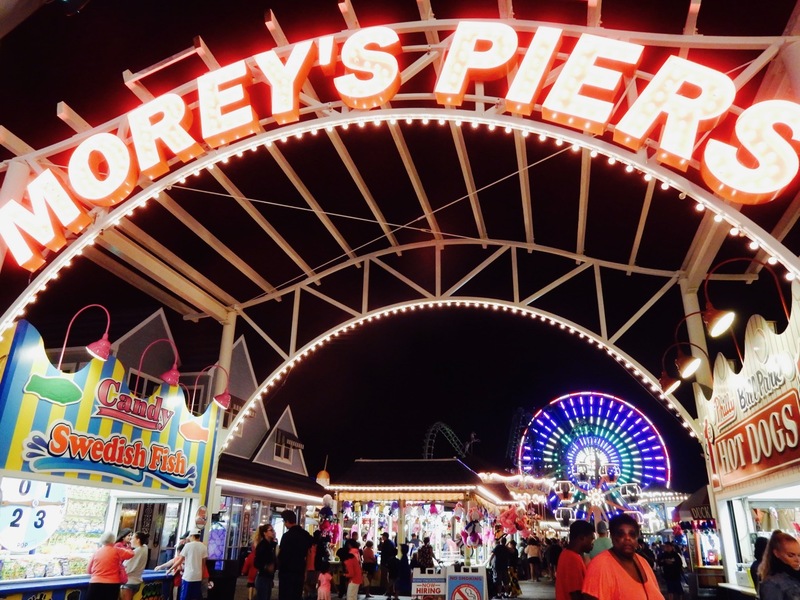 Kohr’s Ice cream lovers don’t have to walk all the way to the boardwalk for a fix. There’s one right on site. $8 per adult for 9-holes, $16 for all 27 holes. 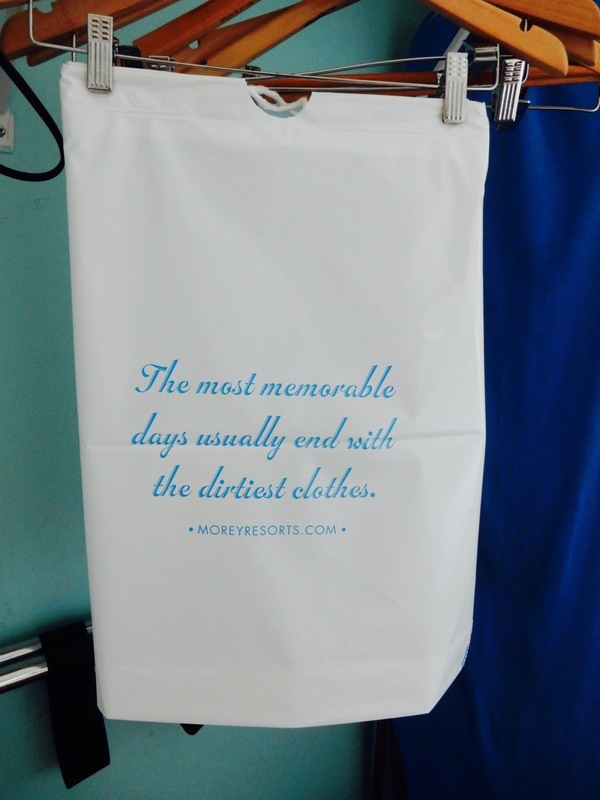 Room rates start at $70 off-season midweek through $350 peak weekends, include laundry (and soap! 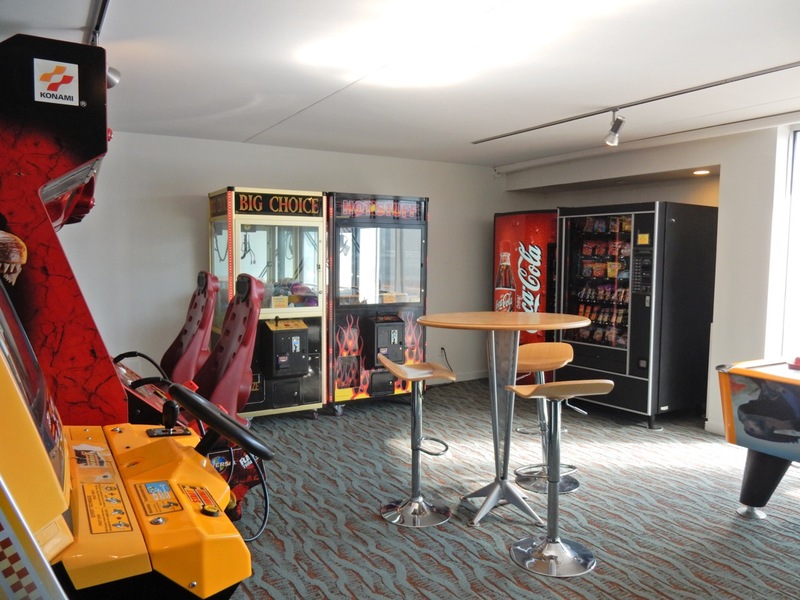 ), wi-fi, parking, continental breakfast, use of bikes, use of beach chairs and toys. Visited Wildwood for the very first time with my family in 2007. Didn’t realize there was a north and south Wildwood and that made a difference. My now ex-husband complained the entire time we stayed at the Starlux. He complained the ocean was too far a walk from the boardwalk, the shops on the boardwalk had lots of gang-related parafanalia, and not many nice restaurants. The kids enjoyed Morey’s Pier, watched a movie on the beach and we eventually found two family-friendly restaurants. The Starlux clothes dryer caught fire the last night we stayed there and we had to evacuate the hotel for a good part of the evening. If you are looking for luxury, it’s not the Starlux. If you are looking for a place to rest your head while at the beach, it’s fine.